You Can See How Many I Have Eaten, originally uploaded by arahbahn. My baking decisions are usually inspired by a new recipe found in a book, from a magazine, or on the internet, but they are fueled by what’s in the cupboard. I wanted to make a non-oat cookie, probably a peanut butter cookie, but I had only almond butter. While I could possibly have a little courage, and attempt to adapt my favorite peanut butter cookie recipe, I sought Google’s help in finding an almond-butter cookie recipe that had flowery description and even more flowery complimentary comments on it. 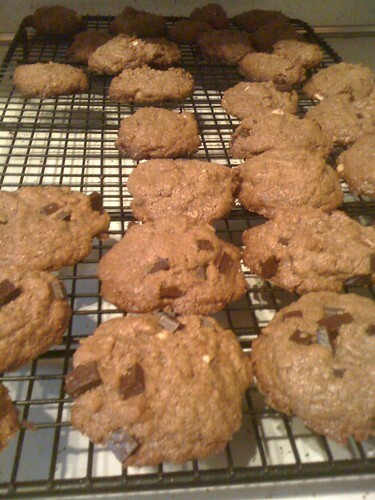 Lo and behond: Flourless Nut Butter Cookies. I’d never baked with sucanat before, so in spite of the fact that I had the almond butter, I went to the store to examine this weird sweet product, to see if the demerara or turbinado I have could suffice. From the looks of it, I thought not. Sucanat kind of looks like tiny pellets of … cardboard. Weird. But healthy, right? More yummy molasses-nutrient goodness. I just had to buy it, and try it in a recipe. Until I added the mega-refined Nestle chocolate chunks, they were doing pretty well on the natural front (just almonds, an egg, sucanat, and some vanilla), but a girl needs her fix, and half of the cookies got some of it. The first one was pretty tasty, if a little less sweet than I had expected. It got better as it cooled. I plan to share these with my van-mates, this weekend, when I participate in the Great River Ragnar Relay. I’m so psyched for this event! I did not manage to get onto a team until just last week, when a friend who was on a team got injured. Now, my Friday and Saturday this week will be spent running, resting, eating (and hydrating), cheering, getting to know 5-11 near-perfect stranger runners, then repeating all of it, three times. My three relay legs are relatively short, but I suppose the endurance lover in me will get her fill, dealing with all three of those legs within 24 hours. Let’s hope this silly tornado and thunderstorm business holds off.